Welcome into Signature Holes, a regular feature here at the Billy Casper Digital Network where we look at the golf course architecture behind some of the best holes in the Billy Casper Golf portfolio. And we close out the year here on Signature Holes with one of the best courses in the BCG family. St. Johns Golf & Country Club in St. Augustine, Fla., is an outstanding public golf experience. It's so good, in fact, that it's played host to some form of the PGA Tour's Q-School tournament eight times since 2004. If Clyde Johnston's course is good enough for some of the best players in the world chasing their dreams in the most pressure-packed of situations, then it's good enough for the rest of us. The entire course is a delight, playing with PGA Tour-caliber difficulty and length from the championship tees but still remaining fair and enjoyable for the average golfer. 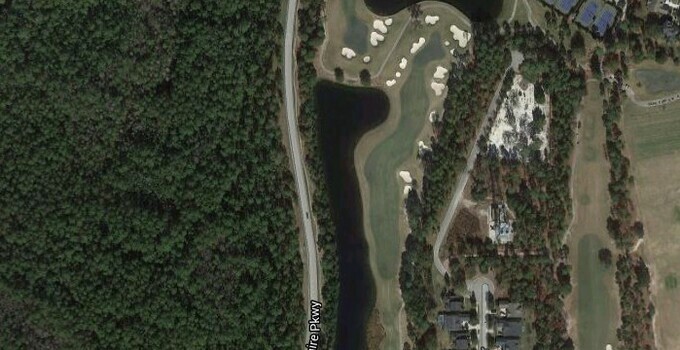 However, there are several holes at St. Johns that play like a beast no matter which tee box a player decides to use. The par-4 ninth hole is one of those holes. From the championship tees, the ninth hole is 440 yards. For stronger players, that's not ridiculously long, but, of course, wind plays a factor as well, meaning a player could get aggressive thinking they caught a favorable wind or stifled from the start wondering how a 440-yard hole can play like a short par 5. The hole becomes more daunting when considering water runs up the entire left side of the hole, kind of like the 18th hole on the Stadium Course at TPC Sawgrass. The noted difference between that Pete Dye-designed hole and St. Johns' ninth is the direction of the dogleg, with St. Johns' hole going sharply right, with some bailout, while Dye's finisher goes slightly left, playing into the hazard. If a player manages to keep their ball dry off the tee, then they're playing an approach shot toward a well-bunkered green complex. Going long, left or right of the green will probably mean a sandy follow-up for the golfer. If the player goes really long, they'll find a water hazard well beyond the green. However, there's room to run up a ball to the green from the deep rough. The putting surface is big, particularly in depth, meaning distance control is critical for a good score, no matter where the approach emanates. And to top off the entire experience, the ninth offers a great view of the clubhouse as the player prepares to make the turn. The ninth hole is a microcosm of why St. Johns Golf & Country Club was rated as the fifth-best course on GolfNow.com through Golf Advisor reviews. The next time you're in the St. Augustine or Jacksonville area -- perhaps to see the World Golf Hall of Fame or The Players Championship in May -- you have to make a stop at St. Johns. No matter whether you want to play a 7,200-yard demon or have a junior who will enjoy the 2,400-yard family tees, it's a top-notch experience with a great value.